Supergirl of Lorien: U10: Rohan Rings & Complete Hytbold in 15 days? U10: Rohan Rings & Complete Hytbold in 15 days? Recently, I was looking for better RK ring options and found the lovely new gold upgrade rings from the barter guy in Snowbourn. Look for the guy over in the west part of town whose name is “Eastemnet Shields, Weapons, Jewelry Quartermaster”; I guess we can call him “EsWe JeQ” for short. 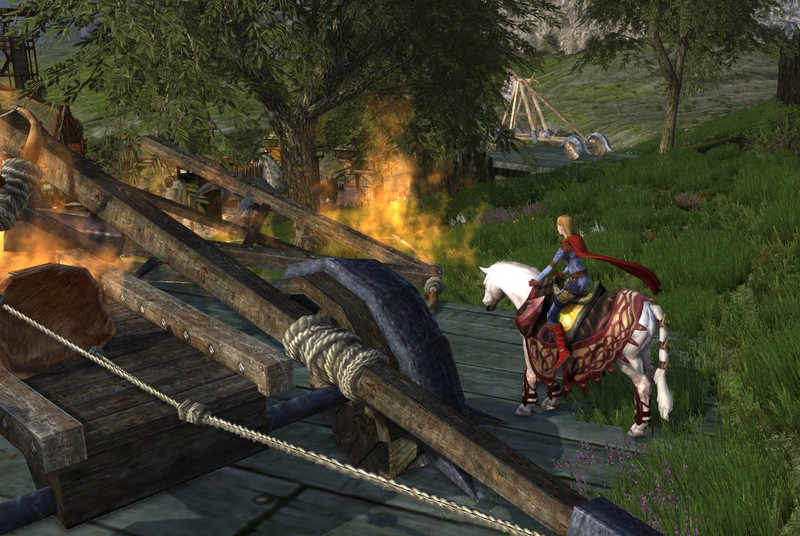 Battered: To build a barter ring, start with a “Battered Ring of Rohan”. By itself, the ring is very plain with no stats at all. It is a common enough drop from Warbands that there are battered rings all over so check your friends or the AH if you need one. Each of the upgrades for the ring will require Sutcroft reputation, so check that box en route to building your rings. 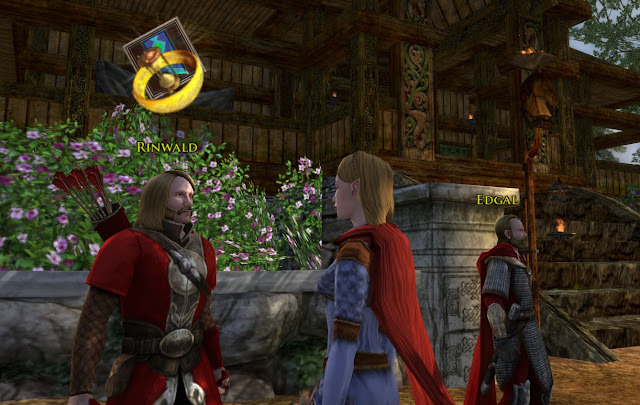 Tarnished: EsWe will let you trade that Battered Ring for a “Tarnished Ring of Rohan” which is purple quality version. He has a lovely assortment which are good for each class. I have shown in this article the “Sage” rings which are for Runekeepers and other tactical classes. There is something for your class so choose appropriately. The cost is one Battered Ring plus 150 Silver tokens of the Riddermark. Glimmering: Once you get the Tarnished Ring, EsWe’s next offer is the “Glimmering Ring of Rohan”, a teal version which is slightly better. Cost is the Tarnished Ring plus 250 Silver tokens of the Riddermark. Gemmed Rings: Finally, the gold versions are the various gemmed “Ring of Rohan”, gold quality. 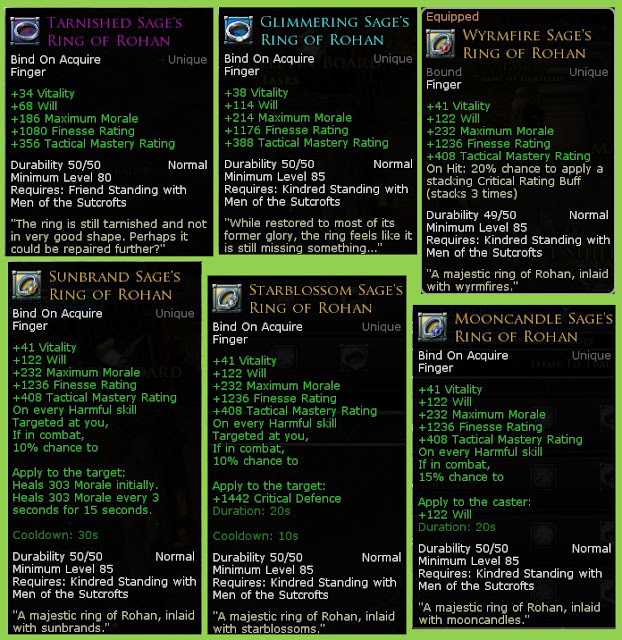 Each of these rings cost the Glimmering Ring plus 3 gems: Mooncandles, Starblossoms, Sunbrands, or Wyrmfires. The gems are rare drops from the new Erebor Raids at level 85. My loot luck is not the best, but I had 8 gems drop in 44 Erebor T1 raid wins so far. Yeah, 44 raids might sound like a lot, but T1 Battle for Erebor is reasonably easy and takes less than 10 minutes win-or-lose for a group to run. 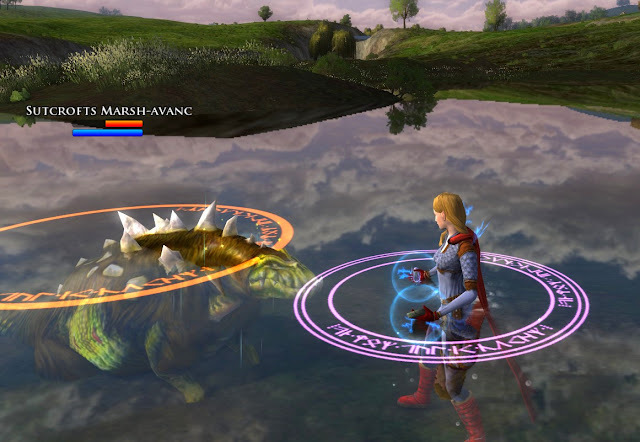 Battle for Erebor is a lot like the Moria turtle except there are 2 trolls instead of 1 turtle; easy enough, right? If you loath raiding, these gems are not bound and are tradable and you can find them on AH (though they tend to be expensive still, mebbe 50-100g at this time). Important Note! All these Rings are Unique and Bound on Acquire. You cannot equip two identical rings. If you are just starting out and don't have the gems yet, keep in mind that you cannot equip 2 identical purple (or teal) rings, though it is likely that both purple (or teal) rings will be necessary to barter for the gold rings of your choosing. You can definitely have 2 gold rings, but they have to be different types. For interest, I chose the Wyrmfire and the Sunbrand. What do Rohan Rings have to do with Hytbold!? 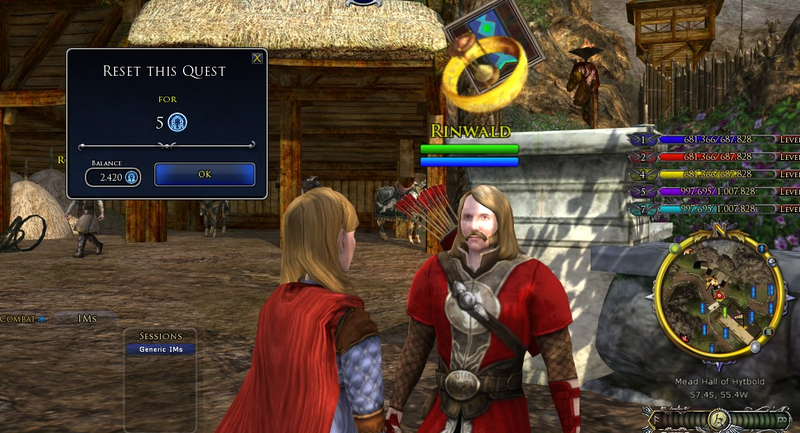 When questing in Rohan, all the quests give Silver tokens of the Riddermark so you have the opportunity to have plenty of tokens by the time you are ready for ring upgrades or other fun things. However, before Update 10, I spent all my tokens and had nothing with which to barter for lovely rings. The only way to get more Silver tokens of the Riddermark was to do repeatable quests. The only repeatable quests in Rohan are the Warbands, a very few landscape repeatables, and Hytbold. 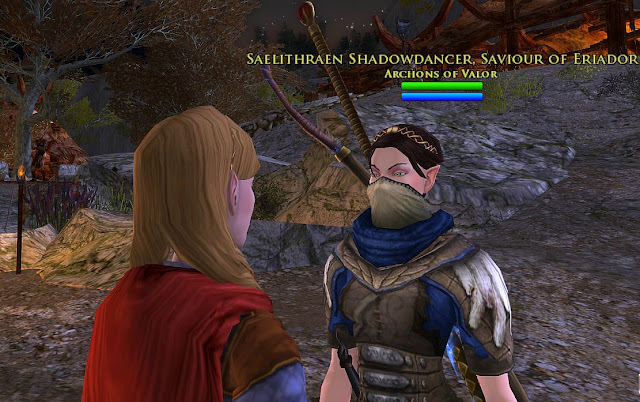 There is a good link on to the forums which spells out exactly which quests are repeatable (forums.lotro.com: Non-Hytbold-Warband-Repeatable-Quests-in-Rohan). Hytbold tokens trade for Silver tokens of the Riddermark 1:1. …and, you can do 5 Hytbold quests per day to earn 25 tokens, right? In comes U10 and Mithril Coin quest resets! Rinwald, keeper of the Hytbold daily quest start, “Aiding the Eastemnet”, will allow you to reset the daily for 5 Mithril Coins. Given that there are 16 total Hytbold dailes, you could reset Hytbold twice in one day and do 15 daily Hytbold quests, earning 75 tokens. For the cost conscious, each Mithril Coin costs 10 TP (or less if you buy in bulk). Each TP costs about a penny (or less if you buy in bulk, or got them for free from deeds). So, a Hytbold reset costs 50 cents at most, or two daily resets for a dollar or less. Mithril coins are a convenience item but if your time is larger blocks on fewer days and your time is worth more than your money, now you could literally complete Hytbold in 15 days, versus the 44+ days it took before Update 10. I feel certain that some would have taken advantage of it when Hytbold was newer, and some who read this article will still do it now. I previously enjoyed the Hytbold adventure in articles to-be-a-thane and supergirl-thane-of-eastemnet. BTW, yes, I did earn 75 Hytbold tokens in one day last Sunday to prove that it could be done, because I wanted to, and because it didn’t cost me anything (since I had Mithril Coins from the U10 conversion from items I had earned during previous festivals). 1. “Aiding the Eastemnet” is to go do the five daily quests. (delete: If you don’t manage to get five done in a day, remember to cancel the quest from your log before you logout. If you cancel it and pick it up next time, you have access to do all five.) Otherwise, the next time you log in you will be in the middle of the “daily” set and can only do the remainder of the five you didn’t do. EDITED from Anonymous's comment below and further research by sleuth Tomrica: "If you cannot do all five daily quests in a day, you possibly do not want to accept "Aiding the Eastemnet". The quest cannot be cancelled from your log. 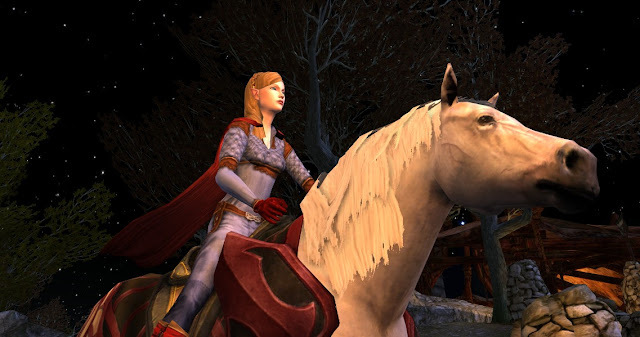 Tomrica sends the discussion link (forums.lotro.com: Aiding-the-Eastemnet-not-cancelable-carries-across-days)"
2. While “Aiding the Eastemnet” can be reset with 5 mithril coins, I do not believe that any of the 16 possible related dailies can be reset. So, it would be little benefit to reset more than twice in a day. I was pretty sure Aiding the Eastemnet quest could NOT be cancelled from your quest log. Am I wrong? You were spot on Anonymous! I changed the article to reflect your correction. Thanks so much! the gems are 105-160 on Imladris =( so not worth it if you cant get them raiding. Yikes Anonymous... That is rotten. I do admit though that Arkenstone gem prices appeared to be on the rise also. I can only surmise that perhaps the novelty of running T1 Erebor runs ad nauseum has worn off and people are not yet winning T2 Erebor raids. Good luck to you on winning some gems or having the prices swing back to more affordable pricing.